Chefman’s 5 tray round food dehydrator is a simple, mid-priced model that should suit the needs of any home kitchen. Here we will look at its specs, price, uses and everything else you need to know about it. It’s easy to use. You can simply slice fruits or vegetables, load everything into the unit and press a button. Later that day, in about 10 to 15 hours, you’ll have your perfectly dried snacks. Many recipes are available online for sugar-coated fruit, seasoned veggie chips and other delicious creations. Making jerky, or any other meat product, in this unit requires pre-cooking because this dehydrator’s one temperature setting of 158 degrees is not high enough to kill bacteria in meat. To begin the drying process, regardless of what you are making, you space the food evenly in the trays. You can use just one tray or all five that are included. Stacking the trays on the base is as easy as stacking a child’s blocks. The heat comes on as soon as you plug the base in. Push the fan button for a nice, steady airflow through the trays. From here, it is a simple matter of checking on it every couple of hours so you don’t overdry your food. The trays are clear so you’ll never have to remove them while the dehydrator is operating. The Chefman’s 5 tray food dehydrator is among the simplest to operate, and it performs as well as any other. The entire unit is made of plastic. It will not crack due to normal use, but both the base and trays can easily break if dropped from a countertop. On the plus side, plastic construction makes for a light unit. The base, which includes the fan and heating element, is covered by Chefman’s 1 year warranty. Truthfully, you are very unlikely to need to file a claim. There are few customer complaints of product failure in the first year. Here is what we like and what we wish was different. This one’s small size makes it easier to store away than other dehydrators with more capacity. Unless you plan to dry a lot of food over a period of a few days, this model will be fine. Thinly sliced fruit dries completely in about five hours. Whole berries and slices of tough veggies, like carrots, take about eight hours. Chips and larger chunks will need 10 hours to dry to the consistency of a raisin and 15 hours to dry enough for long-term storage. Meat, after being cooked rare, becomes jerky in eight hours or so. These processing times are in line with other models of this type and price range. There is no dehydrator that’s easier to use. This is perhaps the biggest advantage here. Others have heat settings that have to be right and timers that need to be set. Timers can be a useful feature if you are experienced in drying food, but you will have to keep checking the progress of your snacks at first. You can check this dehydrator out on Amazon’s website. This is a great dehydrator for occasional use. 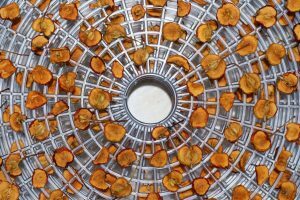 If you prefer ease of operation and simple design over programmability and a loss of real estate on your countertop, this may well be the best dehydrator for you. Check out some more amazing reviews here!